Who put demon rum in the egg nog? Well, that ain't Santa coming through the fireplace! 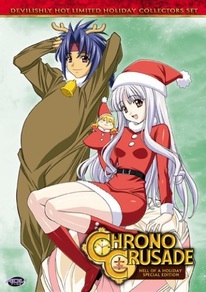 Just in time for the holidays, it's a devilishly hot limited special edition of Chrono Crusade! The year is 1928. Jazz is hot, bootleg liquor is king and the idle rich of a nation have discovered a horrifying new past time: summoning demons! Now the gates of Hell are open and someone's got to put the devils back... If there's one thing the devils do fear, it's the elite Holy Warriors of the Order of Magdalene! DVD Features: Azmaria's Extra Classes, Background Info, Production Sketches, Clean Opening and Closing Animation, Original On-Air Opening Animation, Episode Commentary.